A few weeks back, I found myself in quite the emotional whirlpool. It was Father’s Day weekend and I was thinking about my Dad and the upcoming good-bye to my son, who was about to move to California (from our home in NJ) to begin Chapter 1 – The Real World. I said good-bye to my father 10 years ago and had the honor of eulogizing him at our crowded church, as we celebrated his life. As I collected my thoughts and prepared, I remember spending a lot of time reflecting on what he had taught me, both with his words, and more importantly, through his actions. And now, as my son (Macklin) was ready to head out and make his mark, I felt compelled to “collect and prepare” again. As some of you know, my “culture career” began back in 2003 when our insurance firm, RSI, intentionally defined and began to practice our culture. There is no doubt that we were an exceptional, in fact, award-winning company, because of this focus. We out-hired, out-retained, out-performed, and out-sold our competition for many years. To this day, we get emails from former employees talking about the impact our culture had on them and how it spoiled them to think that all companies operated like RSI. Our HPC tag line reads, Transforming Individuals and Organizations. It’s the start of my answer when leaders ask me about the impact of HPC’s Fundamentals System. There’s no doubt that our clients and their organizations are better because of their work on a High Performing Culture. 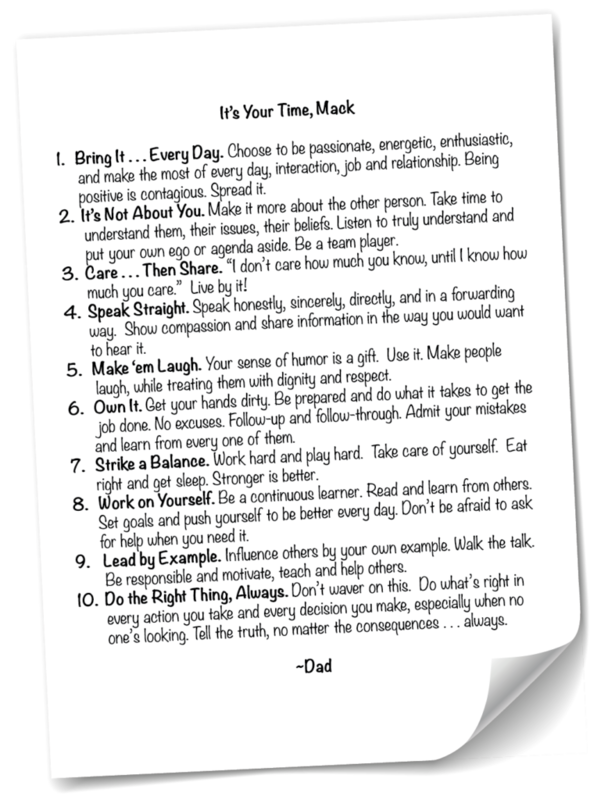 But it wasn’t until I sat down to write a note to my son and share some “fundamentals,” that I realized the massive impact this culture journey has had (and continues to have) on me, personally. Thanks for letting me get personal. If you’d like to learn more about how to transform your organization (and maybe even you! ), just give us a call or shoot us an email, and please consider joining us and other leaders for Culture Summit 2017.